I love a good surprise- however big or small the surprise may be they are always so exciting to give or receive! Surprises to me feel so heart felt that someone thought out a way to bring joy to you and surprise you with something they hope you’re going to love. This is how I feel about this pie, from a glance it looks like a regular old cream pie but once you cut a slice you’re surprised by the dark layer of chocolate ganache that’s hiding under all that cloud-like cream and fresh berries. It’s a chocolate-y surprise anyone would love! This pie is semi-homemade making it a super easy and beautiful treat that anyone can make! You can use any store bought crust for the pie, which is what makes it semi-homemade. I like to use the kind you buy in the refrigerated or frozen section that you can unroll into your favorite pie dish, like this one my mom handed down to me, and bake yourself versus a pre-baked crust. You can also make your own favorite pie crust recipe for a fully homemade pie – it’s totally up to you! Next comes a layer of whipped cream and cream cheese sweetened with confectioners sugar. Another fun surprise comes into play in this layer with the addition of a little almond extract – it’s the perfect compliment to the chocolate ganache and fresh berries. This layer is light as a cloud and just sweet enough, making the perfect pillow for the fresh berries that finish off the pie. 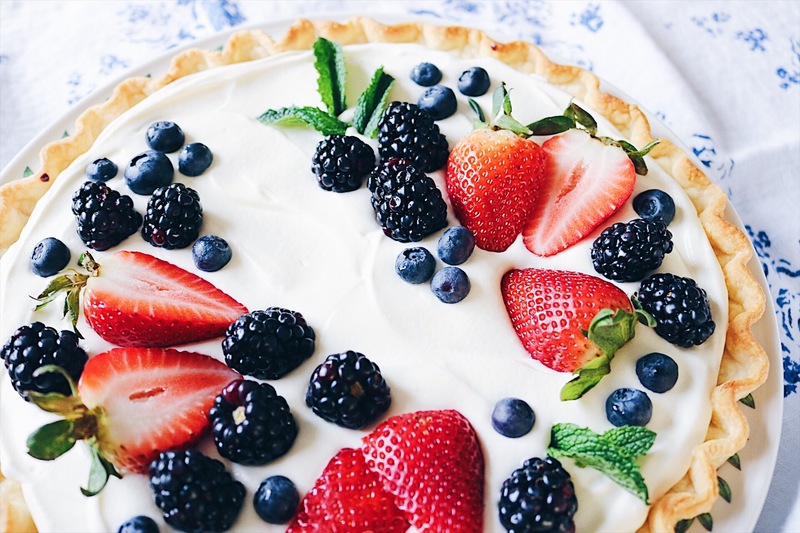 The best part about this pie is being able to get a little creative when it comes to decorating. I had so much fun with this part, along with licking the spoons from the ganache and cream fillings! You can use any berry combination you like or you can use one single type like only using strawberries. You could decorate the entire surface or decorate sparingly, in swirls, groups, stripes, a star from the center or any design that inspires you. I went with a bit of a half circle grouping that used fresh strawberries, blueberries, blackberries and a few fresh mint leaves for some added greenery. 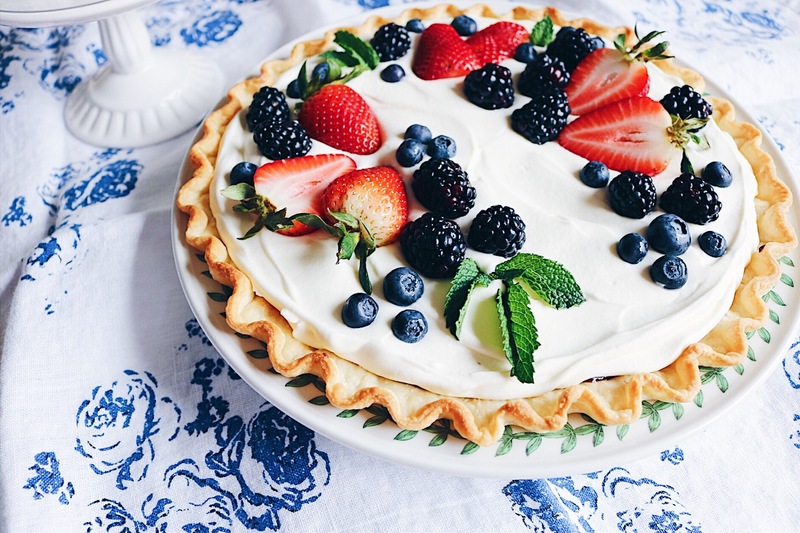 On top of being a lovely surprise, this pie would be beautiful to add to your Easter day menu. On Easter we’ll be going to a team lunch, and then probably spend time together and bbq at home. Hope you all have a wonderful Easter weekend with family, friends, sunshine and a slice of this unsurprisingly delicious pie! 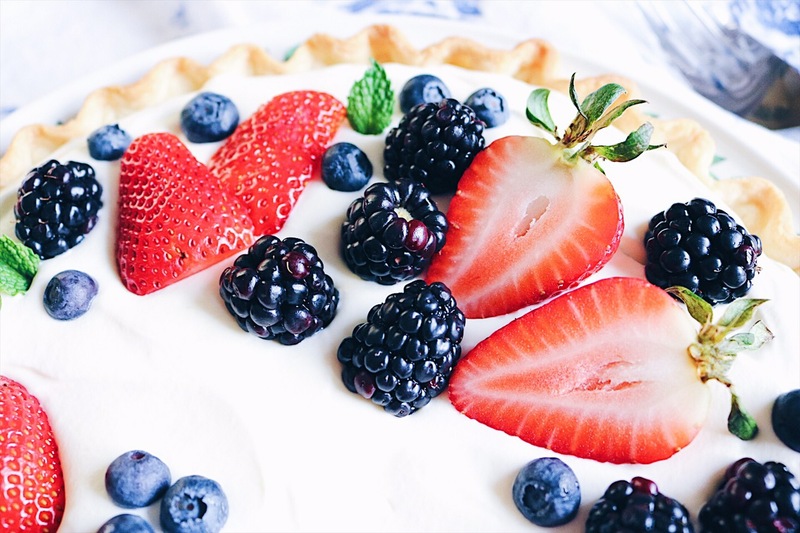 A semi-homemade pie with a hidden chocolate ganache layer topped with a cloud of sweetened cream filling, fresh berries and mint leaves. Prepare your pie crust according to the package directions or recipe if you’re making from scratch. (I used one of these Pillsbury Refrigerated Pie crusts and unrolled it into a 9 inch glass pie dish, baked it per the package directions.) Once your pie crust is baked, set it aside and let it cool to room temp. In a small sauce pan heat the 1/3 cup heavy cream over medium heat, stirring occasionally. Once it comes to a simmer remove from heat and stir in the chocolate chips until you have a smooth chocolate ganache. While the chocolate ganache is still warm spread an even thin layer on the bottom and up the sides of the pie crust. Chill in the fridge for about 30 minutes or until the chocolate is firm. While the chocolate ganache is firming up in the fridge, you can make the cream filling. In a medium mixing bowl with a hand mixer whip the cream cheese until soft and aerated. Next in a stand mixer or separate mixing bowl with clean whisks whip the 1 1/2 cups heavy cream for about 3-4 minutes on medium-high speed until stiff peaks form. Add the cream cheese to the whipped cream in thirds on medium speed until smooth. Lastly add in the confectioners sugar and almond extract, stirring until fully incorporated. Cover the cream and chill in the refrigerator for 30 minutes. To assemble the pie remove the ganache filled pie crust and cream filling from the fridge. Fill the pie crust with the cream filling, spreading evenly to the edges. Top with fresh berries in your design of choice and garnish with fresh mint leaves. It’s best to serve this pie within 24 hours. Keep chilled until ready to serve. 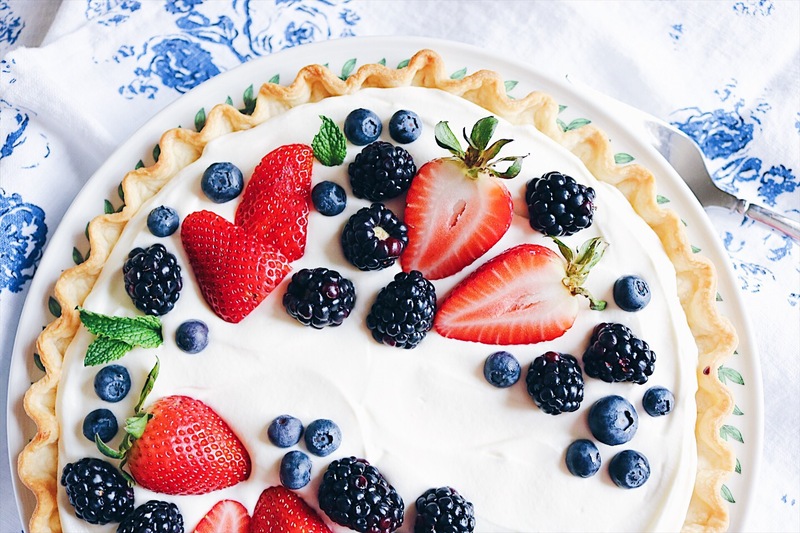 If you decide to decorate sparingly with the berries I recommend having extra on hand for serving because everyone loves extra fruit with their cream pie! Don’t want to miss a post or recipe? Subscribe to email updates or follow along on Instagram or Pinterest!